Everyone or most of us are familiar with the story about or what happened in the Garden of Eden. The Bible reveals that the disobedience of Adam and Eve, after being deceived by the snake has caused today’s sin but do we have to continue blaming Adam and Eve for the horrendous sins people deliberately commit against other people? When the crowd saw what Paul had done, they shouted in the Lycaonian language, "The gods have come down to us in human form!" Acts 14:11. It is, therefore, likely that the snake or the serpent, has sneaked out of the Garden of Eden after Adam and Eve were thrown out and now living with us in human form to destroy and kill a particular race. It’s only a few Africans in the Diaspora, including African-Americans, who feel ashamed of the horrible and degrading events taking place in Africa, therefore, wouldn’t like anyone to refer them as Africans but thousands of Africans, like me, in the Diaspora, want to come back to Africa because I am proud to be an African. Many times, when I write, I read comments such as: “Why don’t you come home to Ghana and stop boasting.” If I should have joined other Ghanaian writers or journalists, who will be actively engaged in writing about clandestine crimes the US government has unleashed on the African continent? These foreign governments with white colour skin, don’t love Africans because of the colour of our skin. They consider us inferior and since they think they are superior, we need to be slaves, necessary to suffer under colonial and Apartheid regimes and also deserve to suffer medical crimes. It’s only a few Europeans and Americans that have real love for black people but millions have the 'wolf mentality,’ meaning they look at black people with total hatred and would find every ways and means to completely destroy, annihilate and tear down Africans. We must agree to the fact that Africa is poor, with unhealthy environments, breeding diseases such as malaria. This is the reason once, I told a Belgian couple that I don’t feel fine, probably, I have malaria; they couldn’t stop laughing at me. According to Sabrina, (her real name) there is no malaria in Belgium. Well, now I understand there is no malaria in Belgium. However, fellow brothers and sisters in Ghana, Africans, who can answer this question? America has the best environment, free from diseases, including tropical diseases. So if the US government attributes Aids infection in Africa to poverty, why the disease is similarly higher in African-Americans, who are enjoying healthy environments in America than the white population? I will not waste my precious time to educate or convince intelligent Ghanaians that the snake has really sneaked out of the Garden of Eden to kill black people. I know that I have been too harsh on Ghanaian leaders in my articles but that doesn’t mean that I hate them. I will not hesitate to praise Nana Akufo Addo or John Mahama for their good works in solving the problems of Ghanaians and improving the corrupt judiciary system. 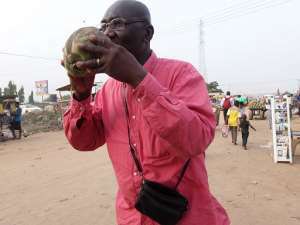 That will give me the assurance that the Ghanaian government cares about the plight of common Ghanaians to encourage me to pack my bags and come back to my sweet beautiful Ghana, to enjoy the fresh sweet coconut water I have missed so much.